Your child’s surrounding is vital to their healthy development and we must strive to make them as stimulating as possible. It is a common mistake to cram your child’s bedroom with bright toys and noisy activities. Everyone needs a chance to relax, and children, especially, need plenty of rest. You must strive to provide a perfect balance between Yin and yang–calm and creative. Your child will sleep better in a place that is relaxing, calming and feels like their own little haven. Sleeping in a bedroom that makes them feel content, safe and secure also makes a huge difference in the sort of dreams your child will experience. If you have a choice of rooms for children, try to choose a bedroom with a view that faces the sunrise. This allows them to benefit from the invigorating morning chi. We have chosen several crystals that are ideal for placing in a child’s room. They have healing properties and carry energies that will help relax your child while stimulating the imagination and encouraging creative dreams. Choose the best crystals for your child! Crystal Spheres: Handling smooth crystals at bedtime is an ideal way for children to relax and let the day’s tensions begin to drain away–however, make sure they do not present a choking hazard for young children. Holding a sphere shaped crystal, like a Rose Quartz Sphere, Agate Amethyst Sphere or Polychrome Jasper Sphere, so that they catch the light from a bedside lamp is thoroughly soothing before they go to sleep. Place the sphere next to their bed after they fall asleep so that the energies radiate in all directions, filling the room with healing, positive and soothing energies. Geode & Cathedral Crystals: Geodes or cathedral crystals, especially ones with druzy, are fun for young children because of the way they sparkle in the light. Closing the geodes to make it “sleepy-dark” inside can be a useful precursor to settling a child down to sleep. Geode and Cathedral crystals radiate mass amounts of positive energy throughout a room due to their preserved natural form and triangular shape. 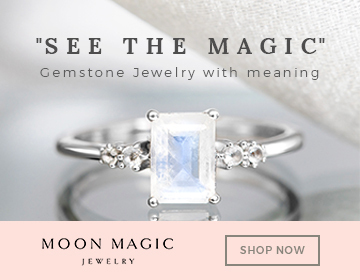 Moonstone: The twinkling and reflective nature of Moonstone stones create a soothing visual wonder for children. It is a soothing and gentle stone that is a favorite of children. It helps to prevent nightmares and help children with sleeping problems establish a more regular sleeping pattern. Quartz Crystal Clusters: Place a large Quartz Crystal cluster in a corner of the room that your child can see from his or her bed. Any light in the room will be reflected and refracted through the many points of this cluster, providing reassuring and comforting feelings every time your child sees these glimpses of light. Children love crystals. Children are more aware and open than adults, and consequently, they are sensitive to the subtle energies of crystals and their healing powers. Crystals can be used in many ways with kids, including babies. This lens looks at how crystals can help with issues such as confidence, calmness, sleep, and study, and how to use stones safely with babies. Children are very receptive to the subtle energies of life that adults lose touch with. Young children will find them fascinating and calming, while older kids can have an interest in natural history and geology encouraged. Babies often experience all kinds of issues and upsets during the early months, as they get used to their senses and the world around them. Calming crystals, in particular, rose quartz, can have a profoundly calming and de-stressing effect. Of course, crystals must be used with the utmost care when dealing with babies and very small children. Small crystals need to be kept out of reach to avoid a choking hazard, and large natural geodes should also be out of reach, as they can feature sharp protrusions or have pieces flake off if delicate. As children grow older, more crystals can be introduced. They can be worn as jewelry or charms, kept in bedrooms, or used as pocket companions to aid study, confidence or focus. Here are a few ways to integrate crystal healing into the lives of your children. Because babies are very open and developing their connection with the world, it is not a good idea to use most crystals with them because it can expose them to energy vibrations they are not ready for, and it will leave them ungrounded. However, there is one crystal which is perfectly safe for use with babies and is even being used in teething rings, necklaces, and rattles. Rose quartz can also help parents feel the joy of parenthood despite the fatigue, and help connect parent and baby, so wear some or place a piece under your own pillow too. Placing rose quartz under a crib or beneath the pillow of an older child can help them drift off into a calm, happy sleep. It will also help them absorb the feeling of love as they sleep, making them feel secure even when you are not physically with them. Crystals can also help with sleep disturbance and night terrors. If your child is suffering from nightmares, it is something to be discussed and soothed, but can also be aided by a piece of crystal beneath the pillow. Prayer or blessings before bed can also help children sleep more easily. If you discuss angels with your child, then a rose quartz angel by the bed is an ideal focus of calm and loving energy. You could also make a dreamcatcher hang over the bed, threading rose quartz and amethyst beads into the center. Modern life, stress, and hyperactivity can all put kids out of sync with the world. Tumblestones in their pockets or a crystal talisman around their neck can help them stay calmer and not worry so much about things. If you child has worries or concerns or is lacking in confidence, crystals can help build their self-esteem. Kids can carry stones in their pockets, or you can make a special “talisman” or amulet together for them to wear when they need an extra boost. You can also purchase crystals carved in the shape of angels or animals. These can act as charms of confidence and support when your child feels nervous, worried or upset. Consider the symbolism of the animal when choosing – for example, pick a wise owl for a test, or a tiger for courage. There are many crystals which aid concentration, memory, focus and other attributes that help with exams, tests and studying. Coupled with a symbolic shape such as a book or owl makes the charm even more potent. 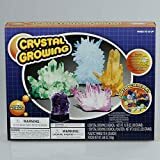 Encourage your children to take an even deeper interest in crystals, and develop a deeper connection with them, by growing their own with a crystal growing kit such as this one! * Grow your own crystals in all sorts of shapes, sizes, and colors! * It’s the perfect Earth Science kit. * Observe how ordinary rocks can turn into glimmering crystal treasures. record keeping log, 1 wooden spatula, and instructions. * For ages 10 and up.